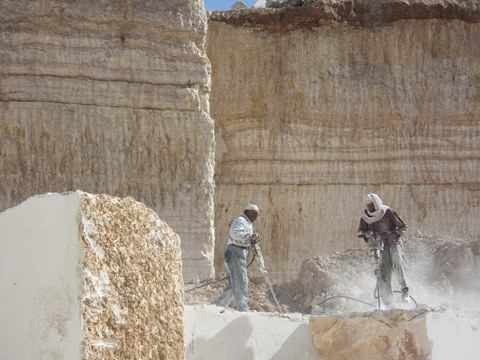 Known by many as Palestine's white petroleum, natural stone is Palestine's most highly demanded raw material. However, the Palestinian stone industry is largely held hostage to serving Israeli construction needs, including the construction of illegal settlements on Palestinian land. Inside villages, cities and refugee camps, natural stone is unearthed at maddening unsustainable rates, leaving behind a wreck of environmental, social and health problems. Any complaints of ordinary Palestinians face persecution by the Israeli occupation, fall on the deaf ears of international organizations, or are merely ignored by Palestinian officials, who are unable to change the course this industry has taken. Muayad Alayan is a Palestinian director-director of photography based in Jerusalem. His recent short film Lesh Sabreen? has been awarded and officially selected at over sixty film festivals around the world. Alayan is also an instructor at Dar Al Kalima College in Bethlehem teaching filmmaking and cinematography. Laila Higazi is an environmental biologist and environmental filmmaker. After moving to Jerusalem, she organized and coordinated several environmental media training projects in the West Bank.